Please continue to use the same method of login after your first time accessing the app—that is continue to either use Google or your email account every time you login. 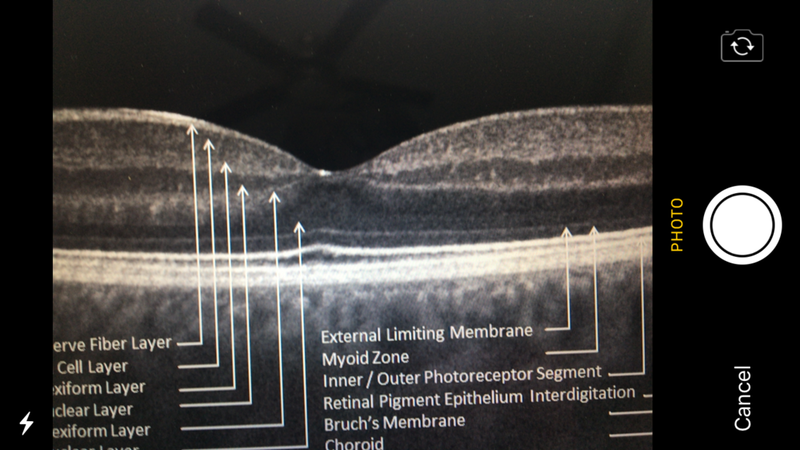 Here you choose an OCT image of the retina. Press the "Choose retinal image" button to be presented with the two options of how to load your OCT. Here you are given the option of either using the Camera to take a picture of an OCT, or the option of Photo Library to upload an image that is already saved on your device. ***If you use the camera option, it is very important to follow the instructions below in order to take a photo the AI algorithm will accept. This screen will appear after one picks the Camera option. ***Once in focus, touch the screen near the middle of the OCT image so that a yellow square box appears. If one takes the picture without doing this, the A.I. 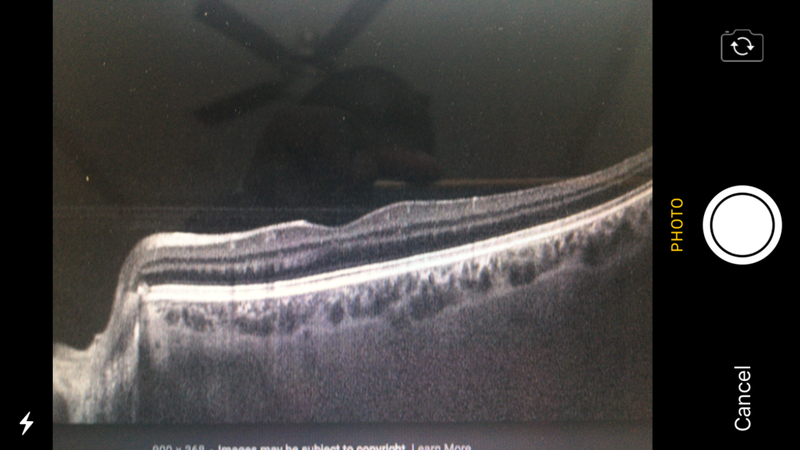 will reject the image saying "This is not a standard centered OCT of the retina." Should be a centered OCT and must not extend outside of the OCT bounding box. In other words, the photo must not extend outside of the black space surrounding the retinal image. Should not contain extensive annotation. The image above is a good image. At the end of this tutorial we have many examples of bad images which will either be rejected by the AI or yield wrong results. There are also examples of good images, which the AI will accept. This is the critical step to taking an AI-acceptable picture with the iOS camera. Make sure you see the yellow box in the middle before you hit the "photo" button. Once the "photo" button has been pressed on the camera, the assessment process begins. Here the AI presents its assessment. The assessment can be one of two possibilities: wet or dry. 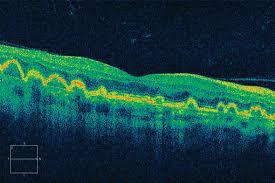 Images with either intra-retinal sub-retinal fluid or both are assessed as "wet" by the AI. And images without any intra-retinal or sub-retinal fluid are assessed as "dry" by the A.I. In addition, the A.I. reports how confident it is about its assessment. In this example it is 99% confident of this assessment. Next, one can either click to view the "Differential Diagnosis & Management" or to "Select another image." This page presents the summary of the differential diagnosis. One can view more details by clicking on any of the buttons on this screen. Fluid Intelligence provides an assessment of wet versus dry. At this time, Fluid Intelligence does not evaluate OCTs to provide a diagnosis. ***The app is intended for use by eye care providers with sufficient training to determine the underlying diagnosis. BAD IMAGE: Because it contains top white panel. It extends outside the OCT's bounding box. The top white panel should not have been included. BAD IMAGE: Because it includes the optic nerve. The optic nerve should not have been included. Instead, the image should have been centered on the macula. BAD IMAGE: Because it includes the image on the left which is not an OCT tomographic slice. It is also a bad image because it includes more than one picture. Good images contain only ONE image, which is a tomographic OCT slice. BAD IMAGE: Because it extends outside the OCT bounding box. The picture should have included only the retina and the dark space immediately around it. Everything outside of the bounding box should not be in the picture. BAD IMAGE: Because it includes more than one OCT slice. Also it extends beyond the OCT bounding box. BAD IMAGE: Because it is not a tomographic OCT slice.